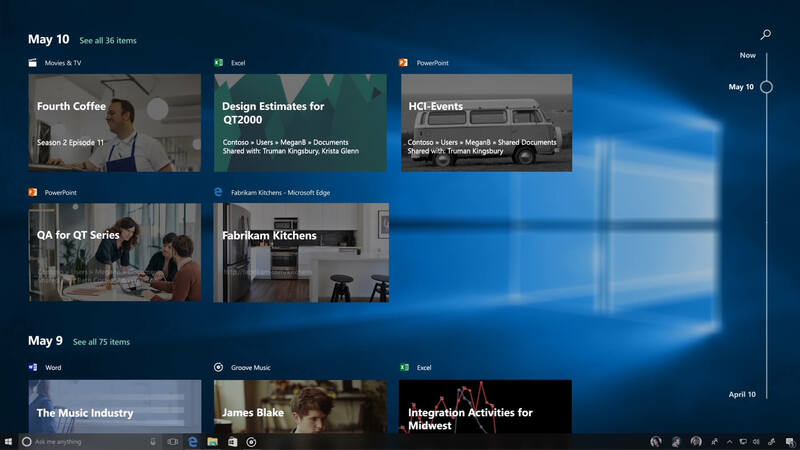 Microsoft on Thursday detailed the next major update on the docket for Windows 10. The Fall Creators Update, announced during the day-two keynote at its Build 2017 conference in Seattle, is a continuation of the work Microsoft delivered in the first Creators Update. It will largely focus on four key features. Timeline is a new feature that utilizes a visual “timeline” to let you “jump back” in time to a previous activity; think of it as a time machine for resuming work on earlier sessions. This seems to work in conjunction with another new feature that lets you “pick up where you left off” working across multiple devices (including Android and iOS). There’s also a new cloud-based “virtual” clipboard that’ll make it easy to copy and paste content spanning various platforms. It sounds a lot like Apple’s Universal Clipboard if you’re familiar with that. The Fall Creators Update will additionally improve the functionality of OneDrive, Microsoft’s file-hosting service. Specifically, the Files On-Demand feature will allow users to grab just a handful of files without having to download or sync an entire folder. Microsoft also provided attendees with a look at its new Fluent Design. Previously known as Project Neon, Fluent Design is described by some as Microsoft’s equivalent to Google’s Material Design standard. You can get a glimpse of what to expect from Fluent Design in the teaser clip above. Microsoft didn’t provide an exact launch date for the Fall Creators Update although the company said recently that significant OS updates would arrive in the March and September timeframes.